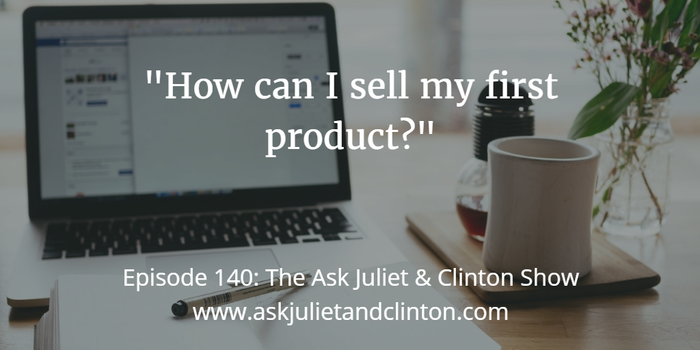 In this episode, Juliet and Clinton answer the following questions: 1) How can I sell my first product? 2) How much should I spend on a professional photo? 3) How can I get better at selling? Episode 139: Can I make money from a membership site? 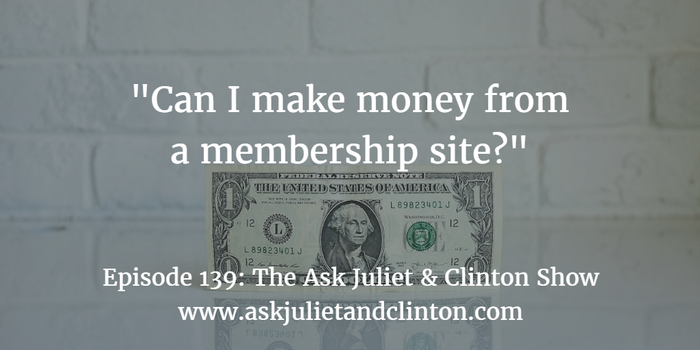 In this episode, Juliet and Clinton answer the following questions: 1) Can I make money from a membership site? 2) What software should I use for a membership site? 3) How can I convert my Facebook group into a paid membership group? Episode 138: How do I deal with Facebook bullies? 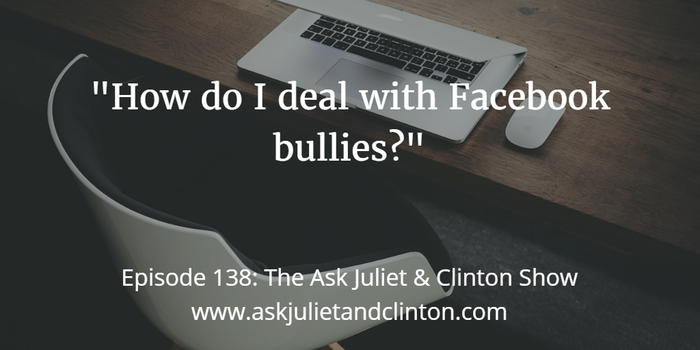 In this episode, Juliet and Clinton answer the following questions: 1) How do I deal with Facebook bullies? 2) How should I approach emailing my email list after a long hiatus? 3) How do I repurpose my content? Episode 137: How do I organize blog posts when I blog on different topics? 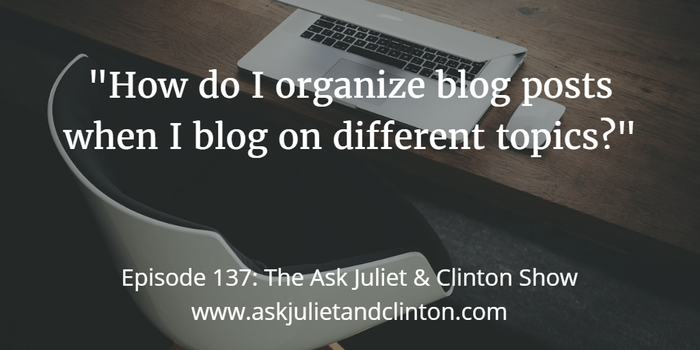 In this episode, Juliet and Clinton answer the following questions: 1) How do I organize blog posts when I blog on different topics? 2) How many therapy directories should I be listed on? 3) How can I get more people to open my emails? 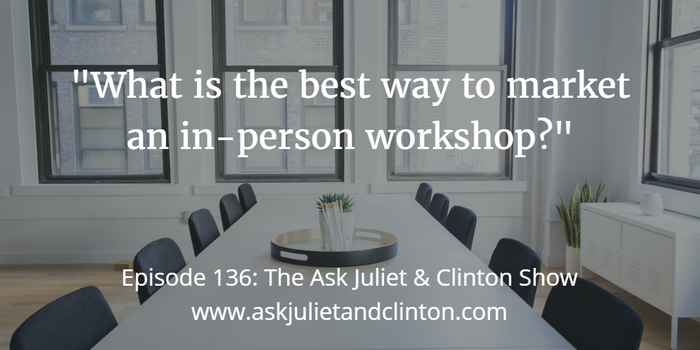 In this episode, Juliet and Clinton answer the following questions: 1) What is the best way to market a in-person workshop? 2) How I can increase my followers on Facebook? 3) Do I need to ask permission to email past workshop participants to let them know about future workshops? Episode 135: How do I track my results with Google Analytics? 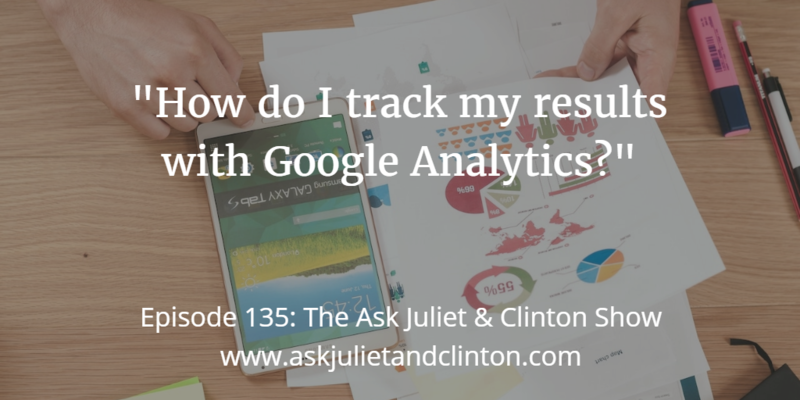 In this episode, Juliet and Clinton answer the following questions: 1) How do I track my results with Google Analytics? 2) How can I overcome my fear of public speaking? 3) Is it worth spending time marketing on YouTube? Episode 134: How can I get my therapy business out of a rut? 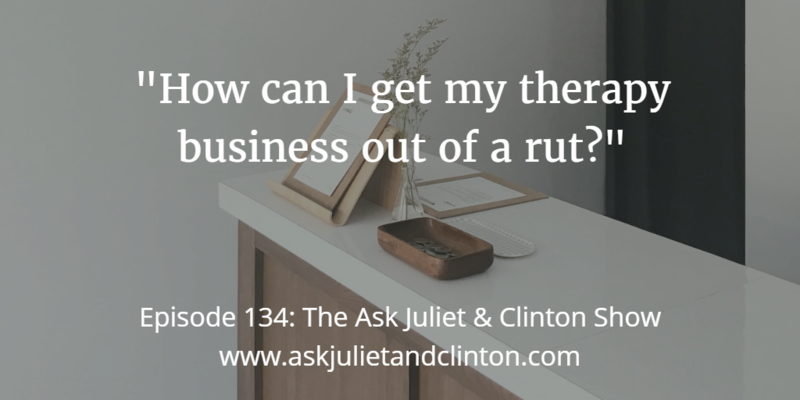 In this episode, Juliet and Clinton answer the following questions: 1) How can I get my therapy business out of a rut? 2) What marketing strategies bring the best results? 3) What are the best offline marketing methods? 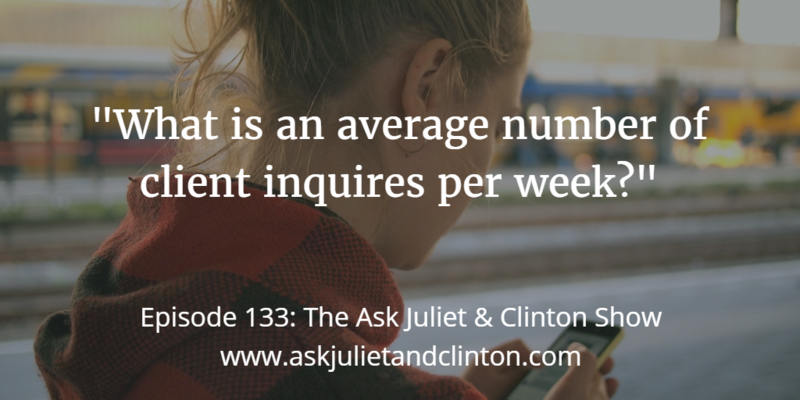 In this episode, Juliet and Clinton answer the following questions: 1) What is an average number of client inquires per week? 2) Should I focus on blogging or guest blogging to increase traffic to my website? 3) How can I protect my business from hacking or randsomeware? Episode 132: How can I get on the first page of Google? 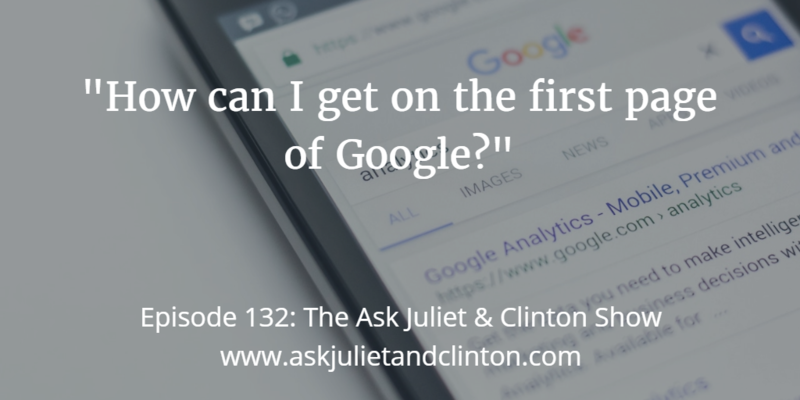 In this episode, Juliet and Clinton answer the following questions: 1) How can I get on the first page of Google? 2) What’s the best way to start marketing to a hospital area? 3) Do I need to target different keywords in my blog posts? Episode 131: I’m struggling to build my practice. Are my fees too high? 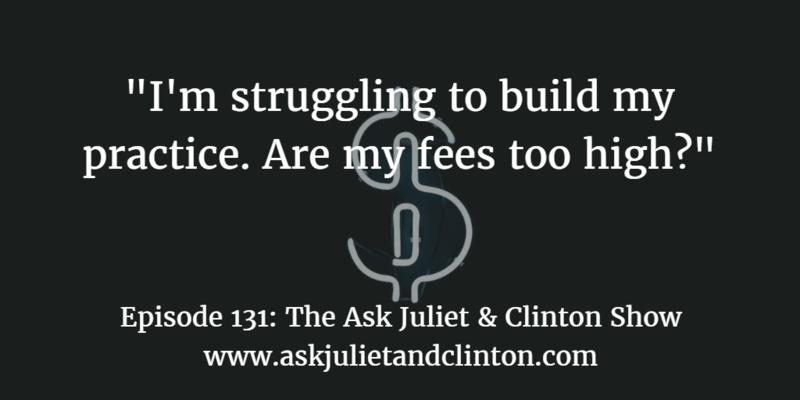 In this episode, Juliet and Clinton answer the following questions: 1) I’m struggling to build my practice. Are my fees too high? 2) Should I offer a discounted package of therapy sessions? 3) Do I need a separate website to market my therapist trainings?